BDP has won a RIBA competition to transform Rochdale town centre, seeing off a strong shortlist which included Adam Khan Architects, Atkins, Bauman Lyons and Land Use Consultants. 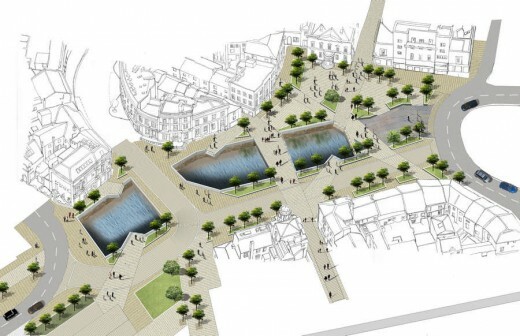 The competition was launched to improve the look of the town centre and better connect the two sides of the River Roch, following plans to reopen it. BDP’s winning design features glass viewing platforms to allow visitors to see the exposed bridges in more detail as well as extensive greenery around the site. BDP will now work the design up in more detail before resubmitting it to the council. The second stage bid for Heritage Lottery money to reopen the river will be submitted in February with the council expecting the results in the summer. Rochdale Metropolitan Borough Council, the RIBA and Places Matter! are challenging teams of urbanists worldwide to be inspired and inspire others in bringing life back to Rochdale’s streets. The main focus of the competition is on the public realm and ginnels around the revealed River Roch as well as the historic bridge in the Butts. Entrants are invited to think about the wider influence and potential of their proposals in particular how the disjointed parts of the town centre may be reconnected. 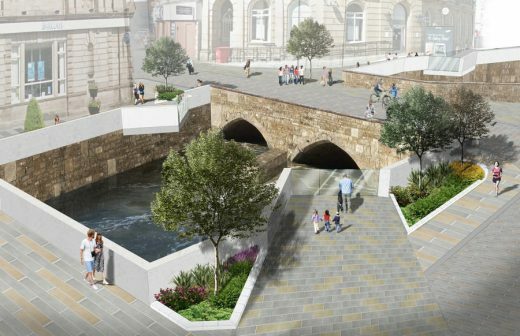 Rochdale MBC plan to reveal the Roch by opening sections of the river through The Butts and restoring the medieval bridge to transform the centre of Rochdale. The ‘discovery’ of the medieval bridge, unknowingly crossed by thousands of people every day is of the utmost significance and will instil a sense of pride, hope and identify for Rochdale. Design proposals are sought befitting of the historic backdrop to bring life and reconnect the streets of Rochdale. The competition is open to architects, landscape designers/architects, urban designers and heritage professionals worldwide. Entries from emerging designers are welcomed and encouraged and where appropriate this may require a collaborative approach. Stage 1 entries will be judged anonymously and five teams will shortlisted to proceed to the second stage with each receiving an honoraria payment of £3,000 +VAT. For further details about the Rochdale Town Centre Competition and how to register for the competition please visit www.architecture.com/competitions and follow the link to Live Competitions. Deadline for receipt of designs is 2.00pm on Tuesday 10 September 2013.